Tim and the crew are moving the frame work forward. Unfortunately, just after posting report #6, we were hit by an unexpected surprise when our 1962 Cummings diesel engine broke a lay shaft effectively putting the Yates Timber Sizer out of duty. We have lost some production time because of the repairs, but Richard got the new parts installed and operational today. Robert is working on the structural insulated panel drawings which will be sent to Murus so they can manufacture the panels used to enclose the timber frame structure. 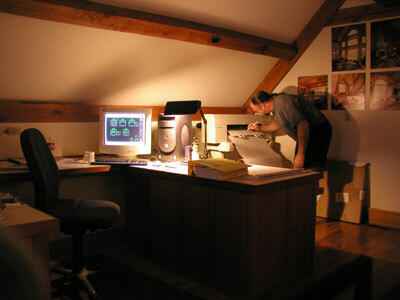 Notice the computer monitor has the red oak frame displayed on the screen. Our HP Plotter went down last Wednesday but we had it repaired and back up in time for Robert to produce the drawings. We've had a series of gremlins around the shop these last couple of weeks! These timbers have already been cut to size and the joinery produced. Most of these timbers are purlins while you can see a couple of girts and rafters in the image as well. 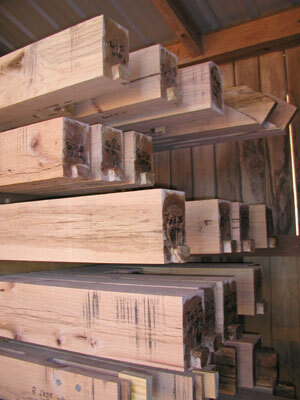 The black streaks you see on the on the sides of some timbers are very typical of red oak. Since red oak has a high level of tannic acid, anything made of iron or steel that comes in contact with the oak will leave these black marks. The marks you see were left by the blades on the Timber Sizer when the timbers were planed. These timbers have yet to receive the final hand planing which will produce the finished surface and remove these imperfections. However, since we will not be applying a protective oil finish to the timbers in our shop, there may be some iron oxide form before you can stain the timbers. If so, it should be easily removed with a bit of finish sanding. 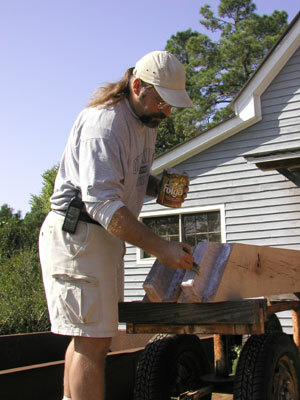 Before we look more closely at the joinery, notice that Steve is applying a white material to the ends of these rafter tenons. The material is actually a wax product that seals the end grain of the timbers. Once a timber is cut, the end grain of the wood is exposed. This makes an easy channel for moisture in to wood to escape which could change the geometry of the joinery. The wax retards the drying process and thus stabilizes the joinery. We don't want things to change too much before we actually assemble the frame in Pagosa Springs. In this image you see mostly girts. The girts will span between post connecting them together. There are several things to see in this picture. First, the dark appearance of the joint is the wax Steve applied earlier to retard moisture release. Second is the way the girts are marked. Each timber has a specific place in the frame and a specific designation so that we can find and install the correct timber. 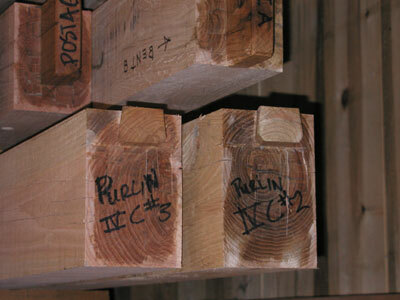 The timber is identified as a girt VII going to a particular post with a particular side facing up. It's really not as complicated as it may appear. Third, notice that the shoulder joints (remember we saw those cut earlier) have stabilizing blocks wedged into the shoulder cut. This is done to hold the slot apart at the correct dimension so the splines will fit easily into the slot. If the slot shrinks from drying before we assemble the frame, it would be difficult fitting the girts onto the splines! You are actually seeing this image rotated 90° to the left so that you can more easily read the timber designation and see the way the tenon was cut. 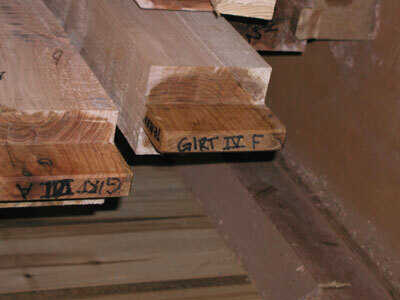 Girt IV F uses a tenon to fit into post F on this side of the girt. If you look closely, you will notice that all tenons (notice both examples) have beveled edges on all sides. This is done so that when the tenon is inserted into the mortise, it won't "plow" into the side of the mortise and gouge out the wood fibers of the joinery and become stuck, before it is properly seated. 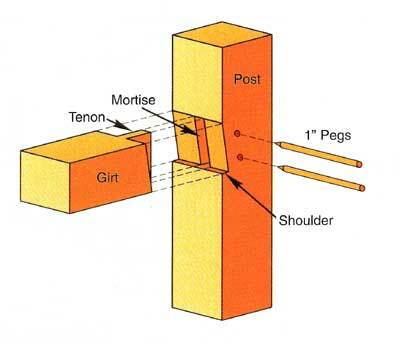 This is a diagrammatic representation of a typical mortise and tenon joint which shows the relationship of the individual parts. The shoulder application you see is a variation of the spline and housing used in your frame. Not all mortise and tenon joints require housings or shoulders. It all depends on the type of forces that will be applied to the joinery. 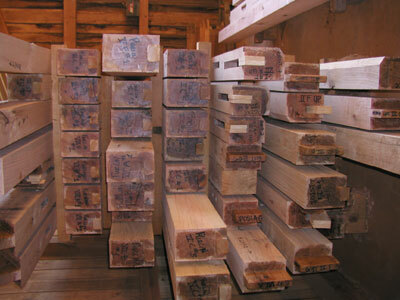 The pegs are oak and we use oak because it is particularly strong across the grain. In this drawing, the forces most likely applied will be to place the girt in tension... that is, pulling away from the post. 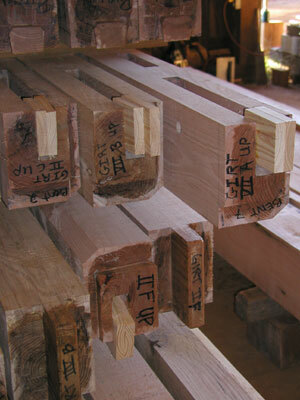 This applies force across the grain of the oak pegs which in turn transfers the force to the post. It took me a long time to understand that most forces in a timber frame are either tension (as above) or compression, which would be the downward force applied to this post... that is, pushing down on the post. These smaller timbers are purlins which will span between the bents. The joinery used here is called the Dove Tail. It is a complex wedge that rest in a housing cut into it's assigned girt. Once the joint is assembled, a small wedge is driven between the dove tail and the housing that securely locks the joint in place. This is just one stack of timbers ready for final finishing. There are a lot of others about the timber shop and there will be a lot more by the end of the week.